« Is the concept of lifelong learning a reality? Digital technologies offer a rich variety of ways in which learners can interact with multimedia resources, and ways in which they can communicate and collaborate. Key technology trends include: the increasing importance of mobile devices and the opportunity to learn anywhere, anytime, learning across boundaries, the potential of learning analytics, emergent technologies such as augmented reality and Artificial Intelligence. 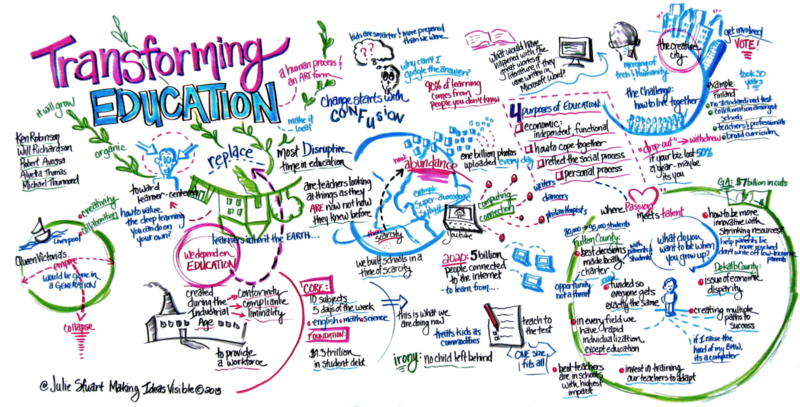 A Horizon summit brought together international experts to consider the future of education. Some of the challenges the group identified included: the need to rethink what it means to teach, the need to re-imagine online learning (and I would argue face-to-face learning), the importance of allowing productive failure, and that innovation should be part of the learning ethos. I would argue that there are three key ‘wicked problems’ facing education today. Firstly that there is a gap between the promise and the reality of what technologies can offer learning. Secondly that teachers and learners lack the necessary digital literacy skills to harness the potential of technologies for both teaching and learning. Thirdly we need to change our teaching strategies and recognize that we are teaching learners to do jobs in the future that don’t even exist today. Therefore we need to shift from knowledge recall to the development of competencies and to help learners develop metacognitive skills and learning to learn. RVS has developed a list of 21st Century competencies based on the principle that education must prepare students fully for their lives as individuals and as members of society - with the capacity to achieve their goals, contribute to their communities, and continue learning throughout their lives. These learner competencies are a set of intellectual, personal, and social skills that all students need to develop in order to engage in deeper learning — learning that encourages students to look at things from different perspectives, to see the relationships between their learning in different subjects, and to make connections to their previous learning and to their own experience. Critical Thinker: Critical thinkers engage in reflective reasoning to build deep understanding that is supported by evidence. Problem Solver: Problem Solvers identify strategies and tools to develop, evaluate, and implement solutions. Innovator: Innovators put elements together to form a new pattern or structure. Communicator: Communicators understand, interpret, and express thoughts, ideas, and emotional connections with others. Collaborator: Collaborators build relationships and work with others to achieve common goals. Globally Aware: Global awareness is the understanding of an interconnected world and a citizen’s role within society. Civically Engaged: Civic engagement reflects a commitment to democratic governance, social participation, and advocacy. Self-Directed: Self-directed individuals take ownership of their learning. Media and Information Literate: Individuals who are information and media literate use technology to explore and build knowledge in an ethical and responsible way. Financially and Economically Literate: Individuals who are financially and economically literate understand and evaluate personal and global economic issues. The changing nature of work and the fact that in the future it is likely that many people will have multiple careers. We are seeing a spectrum of learners, from the demands of the ‘now’ generation who want flexible and adaptive learning opportunities personalized to their individual needs through to those who are learning for leisure reasons rather than for work purposes. We are seeing the emergence of new forms of accreditation, such as digital badges, certificate of participation, micro-credentials, and most recently the potential of blockchain technology to enable learners to document and record their learning across different contexts. We are seeing an unbundling of education, in the future learners may not opt to do three-year degrees, but instead pay for: resources, support, guided learning pathways or accreditation. For teaching there are a number of aspects. Teachers need to focus on the development of higher order skills such as creativity, critical thinking, communication and collaboration. They need to help learners develop lifelong learning habits. Technologies are increasingly important and teachers need to develop the digital literacy skills to harness them appropriately in their teaching. Finally, they need to find ways to motivate their learners by providing experiential, authentic and challenging learning experiences. [In the future we need] learners who master agency [which] lays the foundation for self-directed lifelong learning, a critical skill for thriving in a rapidly changing world and for our nation to remain globally competitive. 21st Century learning means that leaners now how more choice on how and what to learn. As mentioned before we are preparing them for an uncertain future to do jobs that don’t even exist and the likelihood that they will have multiple careers. As with teachers, they need to know how to use technologies effectively and more importantly how to use them for academic purposes. They need to have ownership of their learning and be able to document and curate demonstration of achievement of learning outcomes. I have talked in a previous post about the changing role of teachers and learners, and also a critique of criticisms voices over the concept of lifelong learning. Churchill (2017) considers the ways in which practice is (or needs to) shifting from a focus on teacher-centred to learner-centred. This entry was posted on Friday, February 9th, 2018 at 12:34 pm	and is filed under General. You can follow any responses to this entry through the RSS 2.0 feed. You can leave a response, or trackback from your own site.